A few months ago the Hunger Games premiered, and the food in the movie was almost as talked about as the characters. If you’re a foodie or a food blogger, the series is worth reading just for the food aspect. The main character, Katniss, fell in love with lamb stew made with dried plums. Every time she ate it, I felt happy for her, as much of her life, she went hungry. I created a recipe for that stew, based on the two ingredients and entered it into a contest, for Stapleton’s. I won judges’s choice and part of the prize was a case of dried plums. Beautiful dried plums, but lots of them. Not your grandmother’s jarred slimy prunes, but chewy, moist, rich dried plums. So far, this is the first recipe I’ve made with them. I added some chopped rosemary because the lamb stew had rosemary and I wanted to repeat the flavors a bit and make a grown-up cookie. The proof of how good these were was their disappearance the day I took them to the pool. I almost laughed watching the kids eat one after another, because these are high fiber cookies, not very sweet with more grown up taste. They travel well because they don’t leave crumbs, and there is no chocolate to melt in our southern heat. This is the cookie to take on an airplane or long car ride to keep everyone in a good mood. Stapleton’s California Gourmet d’Agen Pitted Prunes or Dried Plums contain no preservatives or added sugar. I didn’t have to give them a shout out, but I truly believe in their product. These are good for a quick snack, chewy, moist, and only 25 calories each. 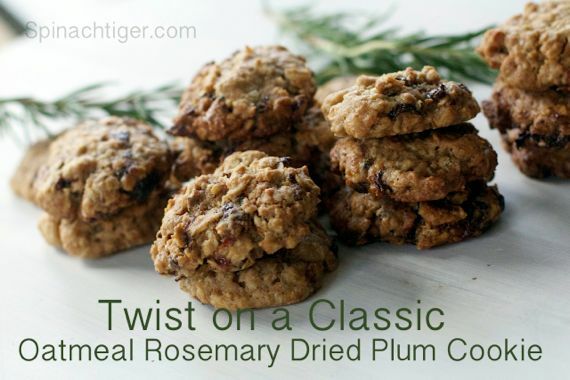 I’m looking for some more dried plum recipes, and if you have any, please send them my way or leave a link. Tell me have you ever won an on-line cooking contest and with what recipe? 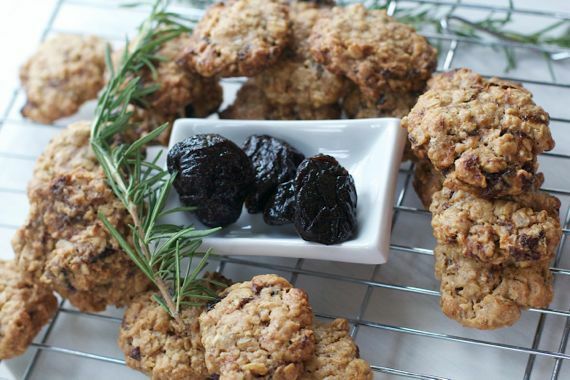 A twist on the classic oatmeal cookie, adding dried plums also known as prunes and rosemary for a high fiber, grown up cookie, kids love too. (adapted from generic rolled oats box). Heat oven to 350. Beat butter, sugar, vanilla on medium speed until light and fluffy. Mix together in separate bowl flour, baking powder, salt, rosemary. Add the dry ingredients to the wet ingredients and mix thoroughly. Add in dried plums. Mix well. Drop onto baking sheet by the tablespoon. Bake for 18 minutes. Cookies may appear soft. Let cool on baking sheet for 2-3 minutes before removing or they will fall apart. Store in plastic container or cookie tin. This sounds so good! I just finished making this batter and realized I did not put in any oatmeal because I don’t see it in the recipe 🙂 Just for my future reference…should the oatmeal have been put in place of the whole wheat flour? I use a cup of AP flour and 1 3/4 WW flour. Thanks for sharing! Rosemary is such a great addition here…very grown up cookies indeed! They sound and look irresistible! 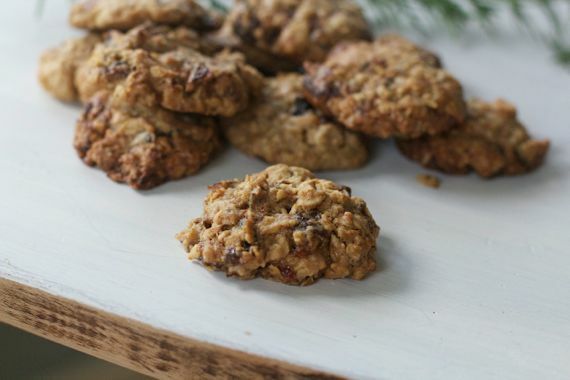 I love oatmeal cookies big time and will gladly polish off any version. This is such a creative variation. I love it. Angela, these cookies look wonderful – I must give them a try. Congratulations on your win. I have not seen or read either…I have been so busy but not busy to eat a few of these…. Although I have not seen the Hunger Games, nor read the series, I have sad about the food involved in the novel. I was inspired to make goat cheese balls wrapped in basil and these plums look like an excellent addition to a family favourite. Very healthy and surely extremely delicious!